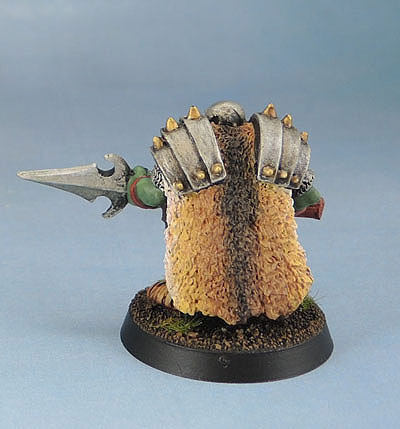 Kev Adams’ Heartbreaker Orc Warlord (1995) | Azazel's Bitz Box. 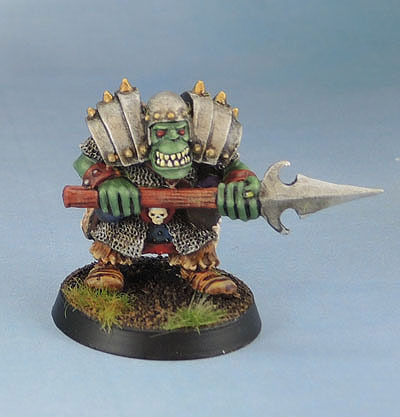 This entry was posted in Age of Sigmar, Oldhammer, Orc and Goblin Army, Warhammer Fantasy - 9th Age and tagged Heartbreaker Miniatures, kev adams, Orc Warlord. Bookmark the permalink. Not seen this orc before, he’s really nice! He’d fit in nicely with the Renegade Miniatures Orcs. The paintjob suits him really well, well done. Cool beans – love the wolf pelt! Cheers Alex. I find it really hard to just paint a fur cloak in one flat colour these days! You are, by far, one of the best painters. Your attention to detail is spot on. I also like how much you consider which colours to use. I’m really enjoying your 90’s Orc collection. Yay! The 80’s were an interesting time for everything! Once again you deliver a beautiful miniature. The fur is the highlight with this one and I take notes for my own attempts at fur in the future. Grey fur is soooo last year. Thank you, and I agree on the fur being the highlight. It was if not one of the first, one of the defining models in my own transition from painting fur cloaks and such in a mono “brown or grey” way and taking more note of animal fur patterns and where the cloaks would have originally come from. While I’m now happier with the paintwork, to tell the truth, I don’t especially like this model. I think the plainness of the helm is one of the big problems for me. I’ve got another of these somewhere that I started converting years ago – adding ridiculous “viking” horns to the helm and swapping the spearhead out for an axehead. I think when I find it I might add a nose bridge strip to the helm before painting. I’m tempted to remove the shoulder spikes as well. Give it a bit more of a lorica segmentata look, though I’d probably paint them (red?) rather than metallic to further differentiate the model from this one. Sounds like an excellent idea. If you go lorica segmentata you could also give the miniature more of a roman helmet design. A Montefortino may be easiest to convert and could have a plume. I’m not keen on the Montefortino look, to be honest. 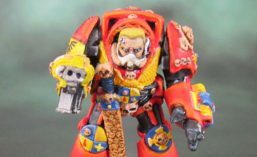 Similarly I don’t like the shallow, half-sized open-face Barbute-style thing that he’s already wearing, so adding a nose-guard will serve to make me dislike the model less. More importantly, there are already horns pinned and glued into it and he’s also armed with a double-headed axe, so I’m already solidly down the path of cartoon orc-viking.